Bees are adaptable creatures that can be amazingly indifferent to the features over which hive designers will spend hours of thought in an attempt to optimize the hive. On the other hand they can also seem frustratingly capricious as they suddenly abandon what seems a perfectly good hive on apparent whim. In fact they likely have sound bee reasons for their behavior but those reasons can remain mysterious to even experienced beeks. And so we are encouraged to fret over details again. For this post we discuss the entrance(s) to the hive, trying to consider their features independently. Top entrances are suggested for ventilation, another subject deserving of its own post, avoiding stuffiness while remaining snug. Bottom entrances make it easier for the bees to take out their dead and other rubbish. Experienced beeks report that the bees will cope with either and some hives have both. There are even hives that compromise and have the entrance midway up the face. One consideration may be whether the hive is on the ground or on a tall stand. Depending on the hive location growing vegetation or drifting snow may cover low entrances. Long side or short side? Middle or end ? Very often entrances are shown in one of the short end faces of the horizontal hive, perhaps only because this seems the natural analogy to the bottom entrance of a Langstroth stack. Next most popular seems to be at the end of one long side. Phil Chandler suggests the middle of the long side, allowing the colony to grow in either direction. He uses a sophisticated hive design with two follower boards and differently placed entrances on each of the long sides. This allows him to manipulate the hive in ways that we beginners do not yet appreciate. Holes or slots ? How big ? How many ? Large enough and/or numerous enough entrances need to be provided to allow foragers to come and go efficiently. Too large or too many and they become harder to defend against robbers. Also some method of reducing the size or number is needed to provide restricted entrance for winter or when the colony is just starting the season and more easy access as the hive fills. A Langstroth hive’s bottom board (a piece separate from the hive bodies) provides a slot, typically 3/8” high, running the width of the hive for roughly 5.5 square inches of entrance. The corresponding entrance reducer consists of a square cross-sectioned length of wood that fits into the slot and occupying some of the width. When bees are few or the weather is cold, in goes the reducer. When the hive is populous and busy in the warm season, out it comes to accommodate the traffic. An entrance hole is easier to provide (simple drilling) although the options of reducing the entrance are pretty much confined to plugging it entirely or leaving it open. One could try plugging a large hole with a stopper that itself had a smaller hole but no one seems to have bothered. It is easier to simply have a group of holes and plug as few or as many as seems right. To match a wide open Langstroth would require a roughly two-and-a-half inch diameter hole. Compared to the size of a bee, that just seems gaping and wrong. A one-inch diameter hole provides about three quarters of a square inch of entrance so that about seven would be needed. Finally some casual beeks simply leave a gap between top bars. One location or many ? Even with the large open slot of the Langstroth hive, beeks will sometimes provide another entrance either by drilling a hole in an upper hive body or slipping a shim between hive bodies to provide a gap. 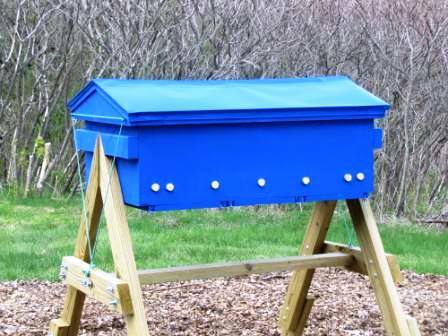 This allows foragers to get to the upper hive bodies without having to first traverse the brood chamber. In a horizontal hive the analog is to provide multiple entrances along the length of the hive. Just no. They are not needed and make it easier for invaders like mice to stage an attack. In conclusion we opted to use holes of 7/8 inch in diameter along the bottom of one long side. This critical dimension was chosen because of the size of the corks we could readily obtain to plug any unused entrances. We began with all but one at the far end plugged when we started with our package but soon opened its nearby neighbor. When we installed the nuc we opened one more. So far, alas, our bees have not multiplied to the point where more entrances are required.